Primary school testing could become a thing of a past after members of the National Union of Teachers (NUT) agreed to consider a ballot for a boycott of future exams. The overwhelming majority of delegates at the union’s conference in Brighton voted in favour of calling for headteachers and schools not to participate in the optional baseline tests - for four-year-olds - from September this year. It also called on Education Secretary Nicky Morgan to cancel the 2016 Key Stage 1 and 2 tests, also known as SATs, this year. If they continue to go ahead, the Department for Education (DfE) will be asked not to use individual schools’ results to inform league tables. The NUT also agreed to consider a ballot for a boycott of all SATs tests from next year. Should the Education Secretary accede to the NUT’s request - made over concerns about the pressure it is putting on pupils, parents and staff - and should schools opt out of the controversial baseline tests for new starters, it would mean school pupils would not sit an exam until secondary education. During an impassioned - though heavily truncated - morning session to discuss the priority motion on primary assessments, teachers lined up to tell delegates of the long-term harm that the Government’s so-called “exam factories” are doing to education. NUT executive member Amanda Martin, presenting the motion, said: “Nicky Morgan and (schools minister) Nick Gibb are presiding over a chaotic, didactic, constrained, unequal, draconian and narrow education system, which seeks to brand children like cattle and brand them for life. Teacher Sara Tomlinson, told delegates: “The worst thing you can do to them at four is sit them down at a table and make them read and write. Union members raised concerns at the Brighton conference about assessments taken by primary-age youngsters, including the new baseline tests, a reading check taken at the end of Year 1, and SATs tests. 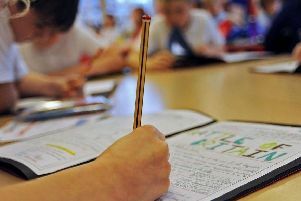 The Government has argued that testing is important to help ensure that youngsters leave primary school with a good grasp of English and maths. The baseline literacy and numeracy checks, which are not mandatory, take place weeks after infants start in reception. The assessments were piloted last autumn ahead of formal introduction this year. The results will be used to chart children’s progress throughout primary school. Last year some 2,000 head teachers declined to take part in baseline testing - that number is expected to increase based on the NUT’s vote. According to an NUT survey published this week, an overwhelming majority (85%) of secondary school respondents said Government accountability measures - such as tests designed to reflect each school’s progress, rather than the achievements of its individual pupils - are “harming the self-esteem, confidence and mental health” of their students. Almost all (92%) said those measures were reducing the quality and time for teacher-pupil interaction, “because of the way these performance indicators and metrics drive behaviour”. And there are serious concerns over Key Stage 1 and 2 tests, with 86% of primary school teachers believing the Government should cancel this summer’s exam because of “the chaos surrounding implementation”.